Do you consider your gams to be among your finest physical assets? Well then by all means, don’t hide them under a midi dress – at least not all the time and certainly not during this exceedingly hot summer! I’m not suggesting that you go around in a Daisy Duke getup. Among the short shorts I have observed this summer, I have come to the conclusion that there are definitely Dos and Don’ts when it comes to wearing short shorts. Let me share some advice I gleaned while style-watching, particularly in New York City and Milan. Wear cuffed denim shorts. The cuff detail is minimal but adds more interest (style) and polish. It also keeps a snug hem from appearing to dig into the leg. Wear your short shorts with something which adds to your style quotient. I’m talking about the star-spangled Chuck Taylors (to the left, below) or the faded denim jacket to the right of her. The muse to the far right makes cutoffs and the 90s overall-with-one-strap-down thing work! Savvy coordination – retro red headband, clean white tee, and black gladiator sandals – makes for a virtually timeless look. Wear shorts which cut into your thighs. Wear a crop top with regular shorts. Wear a fitted top with fitted shorts – either tucked in or cropped – and unremarkable shoes. Wear light-colored high-waisted shorts with a tucked-in white fitted short-sleeved tee and white sneakers. There is such thing as boringly retro, and if you have an inverted triangle body shape, your proportions might not look balanced. Wear a messy bun with a tank in a vibrant hue, cuffed shorts, and multi-colored, sporty watch: subtly tasteful! Light-colored shorts with a neat, white sleeveless top, and metallic thong sandals – a nice feminine touch – it especially works on a petite, girlish figure. Wear bright-colored shorts with an untucked white tank, stylish sneakers, and anything-but-blasé handbag. Play up contrast, pairing ripped cutoffs with a gauzy, flouncy, ruffled off-the-shoulder top – while matching accessories: beige hat with black border and beige sandals with black straps. You may have seen this last muse in previous posts: she demonstrates so much of what is right about Milanese and shorts style. 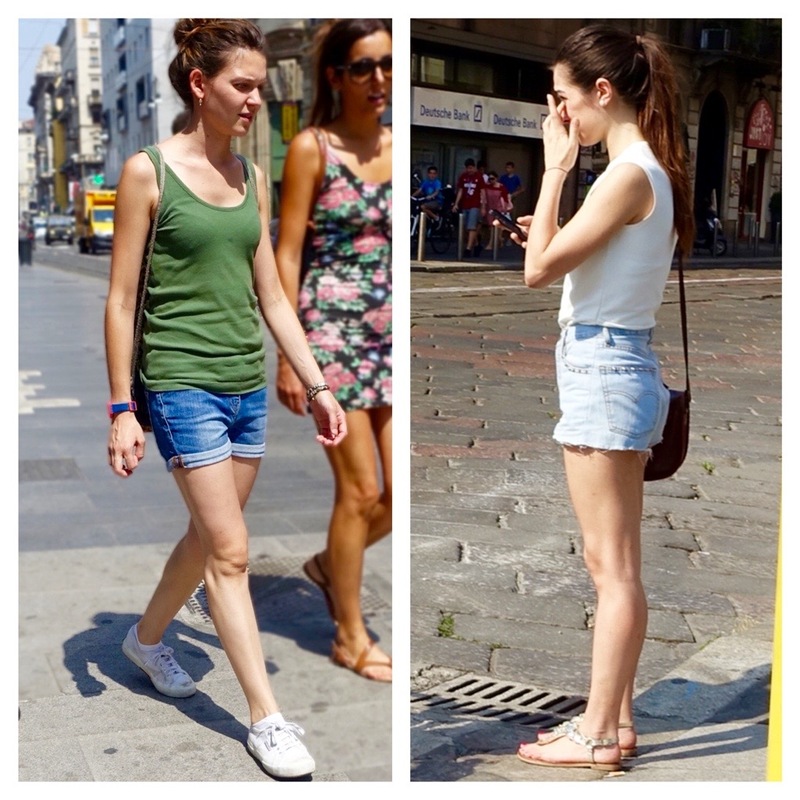 Whether you are in New York where styles tend to be more urban, edgy, sometimes a bit gritty, or in Milan where even casual looks are wonderfully coordinated for balance, interest, and taste, short shorts can be a stylish answer to hot summer days in the city. What’s your favorite way to wear short shorts?